The Section 179 deduction was a tax code created to encourage businesses to buy equipment and invest in themselves. Typically, when your business buys certain items of equipment, it gets to write them off a little at a time through “depreciation” – it spreads the total deduction out across the “useful” years of the equipment. A bit complicated, and certainly not as appealing as deducting the amount all together. However, Section 179 allows businesses to deduct the full purchase price of qualifying equipment and/or software purchased or financed during that specific tax year. All businesses that purchase, finance, and/or lease equipment valued at less than $2,000,000 in new or used business equipment during the tax year of 2016 should qualify for the Section 179 deduction. Most any “tangible good” for primarily business use should qualify – though there are restrictions on certain things such as vehicles purchased for business use. Also, a necessary requirement for the tax 179 deduction code to apply, the equipment must be placed “into service” during the 2016 tax year – so ideally, any large equipment purchases that may require special delivery or installation should be placed ahead of time to allow for the equipment to be in service within the tax year window as well. For a full list of qualifying equipment and restrictions, this list is a great resource for more information. How much could Section 179 save me? The Section 179 deduction can have a real impact on your small business, and greatly lower the “true” cost of your new equipment. On the Section179.org website, there is a very convenient and easy-to-use calculator that gives you a peek at what those savings could be. Click here to enter your own potential purchase amounts to see how much Section 179 could save you this year! Looking for the best gifts to bring along as your +2 for your next summer wedding? We have the perfect tips on wedding market ideas and inspiration, plus some exclusive resources from our manufacturing partner, Unisub.com, to get you started! Prepare a monogram set for the new family, complete with engagement portraits, on these perfectly themed heart-shaped coasters. The coasters are MDF hardboard with an absorbent cork backing, and a glossy top sublimation coated surface for high-resolution printing. 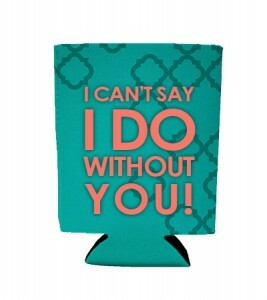 Themed coozies make the perfect bridal party and reception favors for the laid-back, casual wedding couple! Easy to customize in large quantities, and undeniably fun and functional, coozies make the perfect “why not?” touch to every event! Unlock the potential of simple personalized keychains and capitalize on the monogram market with the double-sided aluminum keychain! A durable, inexpensive, and easy product to work with, the keychain is the perfect upsell accessory for a personalization boutique. 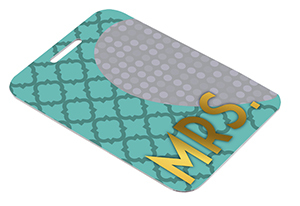 For destination weddings, bridal parties, and honeymoons, the bag tag is the quintessential opportunity for an eyecatching extra touch! Easily functional items like bag tags and keychains are not only an opportunity for a simple upsell or package set offering, but they are just as head turning for your customer, which keeps the word of mouth moving! Offer a fully matching luggage accessory set for larger orders with the soft luggage handle wraps! These super-soft handle wraps are the finishing touch to travel in style, and cushion the strain of jet lag and heavy baggage! Make sure this luxurious natural serving tray kit makes its way to the gift table! The handy tray bottom insert is easily imprinted, and then the entire tray assembles quickly for an impressive product that at first glance, doesn’t even seem printable! Available in two sizes, as well as a natural wood or espresso grain finish, the serving tray kit is perfectly paired with customized coasters and mugs, too! Creative Border ornament pieces aren’t just for Christmas – they also make extra-classy labels, place markers, give-away keepsakes, and alternative photo display opportunities! Creative Border ornaments have a polished semi-gloss printable sublimation surface that is two-side customizable, and are made of a strong and light finished aluminum. 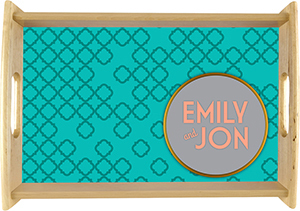 Whip up a gag bridal gift, or a fun touch to a group in a destination wedding with a custom printed door hanger! The plastic door hangers are double-sided printable and composed of a durable, glossy plastic substrate. Bonus idea: For the ultimate fashionista who’s also incredibly organized, trendy printed door hangers also make great clothes rack label/separators! Create a lasting impression with customized printed save-the-dates on easy promotional items like magnets! These glossy sublimation plastic substrates come complete with self-adhesive magnet backings, and can be full-color printed with photos, wedding information, and more easily with sublimation! 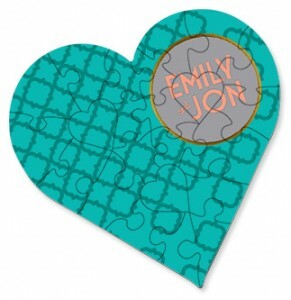 This upscale twist on the classic jigsaw puzzle offers some unique personalization opportunities! The hardboard surface has a glossy white sublimation printable coating, and also features fun nested ‘heart’ pieces within the 23 piece set. They make a fun party favor for the kid’s table at the reception! 5 Ways to Add Fireworks to Your Projects! In today’s fast-moving fashion industry, sometimes it can be hard to catch your customer’s eye! Be sure to try out some of these shimmering, sparkling products for a unique way to add dazzling accents to your printed products and custom offering! Use rhinestones on.. nearly everything! One of the easiest things you can do to accent your printed designs, products, or tees with a dash of sparkle is with rhinestones! Available in three sizes, our Bella MC rhinestones offer a multi-faceted machine cut top for maximum brilliance and are easily heat set on most surfaces with a standard heat press. We’ve safely applied them to a wide range of fabrics, including synthetics, with success and durability, and a WIDE range of “hard surface” products too! That’s right, mugs, keychains, you name it – the hot-fix adhesive isn’t quite durable enough to be applied to an item that requires dishwashing or daily handling, but your bejeweled gifts will be worth the attention and care! Want to start creating your own rhinestone patterns and templates? Our favorite tools for rhinestone decoration and creation are the Sticky Flock template materials and Starter Kits that work great with the Silhouette Cameo cutter! 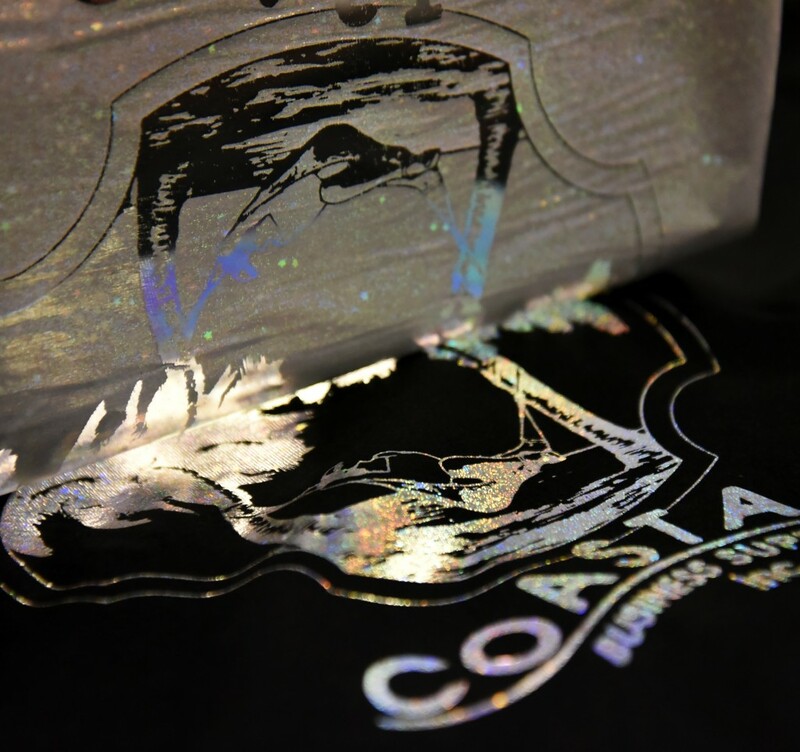 Heat transfer foil glitzes up printed patterns and logos! Heat transfer foil is one of the easiest and dazzling ways of glitzing up a simple text/art print, and only takes a heat press and a laser printer! Once a “base” is created and applied to the shirt (see our other tutorials on adding foil to papers like Forever or ImageClip for dark fabrics), a textile transfer foil is laid over the top of the print, and the foil layer is sealed to the top with the use of a heat press. This method also offers other unique design and print opportunities, like “texturizing” the foil by crumbling the sheet ahead of time for an “aged” metallic appearance, or even pressing with multiple foil colors for an added dimension to the effect! 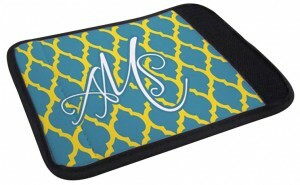 Add a dash of glitter (or sublimation) with Glitter Flake Heat Transfer Vinyl! 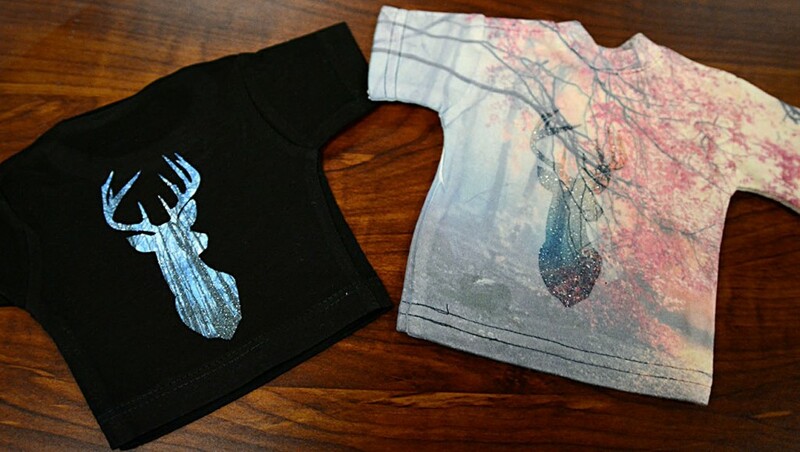 Adding specialty effects and textures to high-end fashion products or garments isn’t possible with standard textile pigment inks and transfer products – but with a vinyl cutter, even a simple craft cutter such as the Silhouette Cameo (or the Cricut, if you’ve got it! ), can create intricate text and logos recreated in colored glitter. Glitter Flake heat transfer vinyl makes this possible with a heat transferrable glitter material that can be easily cut with a craft cutter or plotter, and is simply heat pressed onto fabric goods! 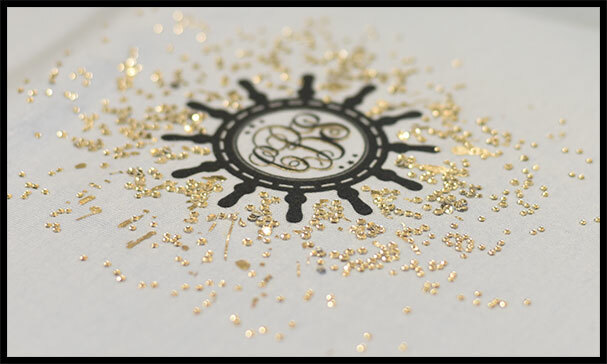 Add just a splash of sparkle, or a full custom logo tee in Glitter Flake – it’s up to you! Attention dye-sublimation printers! Did you know that white Glitter Flake can also be sublimation printed? So if you’re needing a custom color, pattern, or even full color image embedded in scintillating sparkle, then Glitter Flake is for you! Check out our tutorial to see how it’s done! Create chrome effects with XPress Cut Mirror! Metallics and chrome are back on the red carpet, and XPress Cut Mirror heat transfer vinyl offers an easy way of replicating this high fashion trend! Create limited edition metallized prints for your own personal brand line or offer as an upsell option for customers with this CAD-cuttable metallic vinyl that works in all standard vinyl cutter/plotters! Available in silver and gold, this vinyl can be applied to a wide range of fabric blends and types! Don’t have a laser printer for heat transfer foil transfers? Use Digi-Cut Metallic! Digi-Cut Metallic is our thinnest metallic film and very closely replicates the uncommon and brilliant texture of foils! This gleaming vinyl film is cut and weeded with the help of a vinyl cutter, and heat press applied at a low temp, and is compatible with a multiple fiber blends. Bonus Tip: Digi-Cut Metallic works amazing as a light foil accent with rhinestones and sublimation prints for a stunning fashion transformation for your custom designs and unique brand lines. Use splatter paint textures and images to create precut foil accent sheets to add to multi-media applications for creations where no two are ever the same!